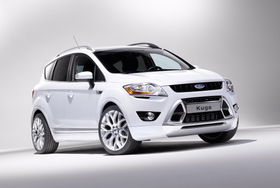 Ford could export Kuga from Kentucky to Europe. DETROIT - Ford Motor Co. could export Fiesta and Kuga cars from North America to Europe as a way to exploit its manufacturing flexibility, global vehicle platforms and the weak dollar. "It's all a business decision, and it's part of our plan to be flexible and be able to move up and down much easier, which allows us to support different markets," Ford CEO Alan Mulally told Automotive News in an interview. While Mulally said he had no specific news to announce, sources say a plan is forming to export the Kuga crossover from a U.S. production site. The Kuga is assembled in Saarlouis, Germany for sale in Europe. In late 2011, Ford plans to start assembly of the next generation of the vehicle in the U.S. at Louisville, Kentucky. It will replace the current Escape crossover. Lincoln and Mercury versions also are planned. In addition to the U.S. models, Ford now is expected to build European-spec Kugas in Louisville for export, sources say. Longer term, Ford will have the potential to export a wide range of vehicles from plants in North America. The Fiesta subcompact, Ford's biggest seller in Europe, will go into production at a plant in Cuautitlan, Mexico, early next year. Ford of Europe CEO John Fleming told reporters last week that if demand warrants, Fiestas could be shipped from Mexico to Europe. "The one virtue we've got with our One Ford strategy is -- apart from anything which legally needs to be different -- the products are the same," Fleming said. "So in any case, from anywhere, you could import and export products." Fleming noted that volatile currency exchange rates make it difficult to make long-term plans for exporting. Indeed, when the value of the euro rose sharply in early 2007, Ford scrapped a plan to make a Lincoln-badged version of the Kuga in Germany and export it for sale in the U.S. market beginning in 2008. 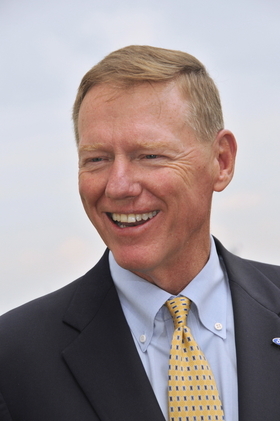 Mulally aims to sell the same vehicles in various global markets. In addition to the Kuga and Fiesta, Ford plans to produce several other global vehicles in North America in the next few years. They include the next-generation Focus and C-Max, the Transit Connect small van and the Transit full-sized van. Soon after arriving at Ford from Boeing in late 2006, Mulally launched the company's One Ford strategy to sell the same vehicles in various global markets with only minor differentiation.